The Choice is Clear... PeroxiClear™! PeroxiClear is the Most Advanced* Peroxide Solution. PeroxiClear is a unique and innovative peroxide solution specifically formulated to deliver superior all day comfort. Brought to you by the eye health experts at Bausch & Lomb, PeroxiClear solution provides outstanding care for all soft and gas permeable contact lenses. 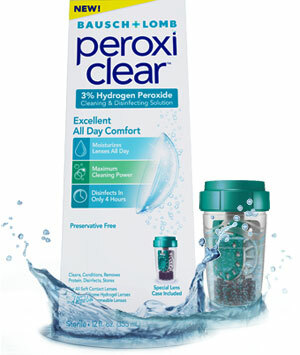 Only PeroxiClear solution features Triple-Moist Technology, a unique combination of ingredients that attracts, retains, and spreads moisture over the surface of your contact lenses, allowing you to wear your contact lenses comfortably all day long. Bausch + Lomb PeroxiClear solution can be used with all soft contact lenses including silicone hydrogel lenses and with rigid gas permeable lenses. Please carefully read the directions for Use with RGP Lenses, as they are different than with soft lenses.